What's happening with the GTX 1080 Ti? Late last year, all the rumors swirling around the GPU world pointed to a CES 2017 announcement of the anticipated GeForce GTX 1080 Ti. To some, it seemed like the perfect scenario: Nvidia CEO Jen-Hsun Huang was giving the main keynote, the Titan XP was six months old (I still don't like Nvidia calling it Titan X, since that was the name of the Maxwell GM200 version of the Titan), and there would be millions of people worldwide listening in. And we all got trolled. I even had a skeleton article in the works, just in case it was announced. Hope springs eternal and all that…. In retrospect, it's not really too surprising that Nvidia didn't announce the 1080 Ti at CES. When was the last time Nvidia announced any major PC-centric device at CES? Pascal was unveiled at Nvidia's own GPU Technology Conference (GTC) last year, with the 1080/1070 previewed and then launched just before Computex, followed by a staggered rollout of the 1060 6GB/3GB and then the 1050 and 1050 Ti. The previous generation GTX 980/970 cards were revealed at another Nvidia event in September 2014, with the Titan X teased at GDC 2015 and released a couple of weeks later, and 980 Ti happened to arrive just before AMD's Fury X. 780 Ti came out in November 2013 and the original Titan was announced and released in February 2013. If Nvidia has ever announced a new high-end graphics card at CES, I'm not sure when it happened—maybe in the early '00s or late '90s? At best, the Consumer Electronics Show has been a place for the company to focus on, not surprisingly, consumer-centric products. And since the early '00s to the present, CES has become less and less about PCs and more about smartphones, tablets, televisions, and automobiles. "No, that's not a 1080 Ti behind me." We already know GTX 1080 Ti didn't happen, but when will it actually happen? Here are the possible scenarios as I see it. Option one is to do a launch unrelated to any industry events. Past history says this is by far the most likely scenario. 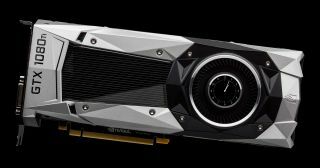 Nvidia would get the GTX 1080 Ti out sometime between now and June. That's a very nebulous date, obviously, but let me provide at least one tidbit I heard when I reached out my feelers and tried to find out what's going on with 1080 Ti. One source said that Nvidia is rumored to be holding off launching the GTX 1080 Ti until AMD's Vega is released—potentially even launching after Vega. Nvidia spoiled the launch of the Fury X by releasing its 980 Ti that delivered near-Titan X levels of performance at two-thirds the price right before AMD's launch. Will Nvidia do it again—and can Nvidia do it again? I certainly expect it to try. Option two is that Nvidia announces GTX 1080 Ti at GDC, the Game Developers' Conference, at the end of February. AMD is rumored to be doing its official launch of Ryzen at the show (AMD has its Optimizing for Ryzen CPU presentation on the docket), but if you look at the GDC schedule, nowhere does it appear Nvidia has anything related to new graphics cards. Again, not surprising considering the target audience of GDC—game developers, not so much people who play games. The third possibility has at least a moderate chance of happening: PAX East, which is the middle part of March. PAX is a gaming show, and as such it's the right environment for a new GPU. In order of likelihood, this is number two on my list. Of course, all the people that expected a CES launch have migrated to PAX East as the next step. They'll eventually be right (if they're wrong on PAX they'll move to E3/Computex), but I'm not convinced PAX is the place for Nvidia. Usually, they like to have more control/presence at major product launches. Of course PAX doesn't publish their schedule months in advance, so that's another tick mark for this option. Option four is a lot like option two: announce 1080 Ti at GTC. But the GPU Technology Conference tends to focus on artificial intelligence, machine learning, and GPGPU applications using CUDA, and not so much on games. This is why Tesla P100 and the Pascal GP100 were unveiled at the event last year, and why it's unlikely 1080 Ti will show up (unless it's launched prior to GTC, though even then it wouldn't be a major presence at GTC). Also, GTC 2017 doesn't currently show anything related to GeForce on the schedule. The last option is also higher probability, and that would be to unveil the GTX 1080 Ti at Computex or E3. And considering Computex is at the end of May and beginning of June, and E3 is mid-June, this isn't really all that different from launching the 1080 Ti around the same time as AMD is expected to launch Vega. What I'm saying, then, is that in my view there's a very good chance the GTX 1080 Ti isn't coming out in the next month or two, and more likely it's four to five months out. This is what happens when there's no serious competition at the high-end of the graphics card market. For now, AMD's fastest GPU remains the Fury X, which sits slightly below the performance level of the GTX 1070 and 980 Ti in average performance across a large suite of games. The GTX 1080 is comfortably ahead by 30 percent, and the GTX Titan XP is another 25 percent above that. AMD's Vega sounds promising, though I'm still more than a little concerned about power and efficiency (Vega 10 appears to be a ~275W part based on what we know of the Radeon Instinct MI25). Estimating by the 25 TFLOPS number, Vega should land relatively close to the Titan XP in performance—potentially faster if AMD's architectural changes have a significant impact, but more likely close to parity. Considering the GTX 780 Ti was faster than the original Titan and cost less, and the 980 Ti was within two percent of the Titan X and cost less, there's a very good chance the 1080 Ti will be very close to Titan XP and cost around $700-$800. So if you're waiting for the GTX 1080 Ti, or AMD's Vega, best guess right now is a near concurrent launch of both GPUs sometime around May/June. And if you want to know how they'll perform, best guess is a few percent slower than the Titan XP—maybe a few percent faster from AMD if things pan out. That might not be the most exciting news in the world, but a 25 percent improvement over GTX 1080 performance one year after launch is a lot better than the 5-10 percent increase in performance we get on the CPU side. Or you could just drop your settings to 1080p medium and game happily on significantly less expensive and/or older hardware. Here's to hoping AMD and/or Nvidia prove me wrong on the timing, but I'm not holding my breath.